Today we’d like to introduce you to Richard Adelman and Trudi Perry. Richard, Trudi, can you briefly walk us through your story – how you started and how you got to where you are today. We all would benefit from a “Third Place”; A “Great Good Place” Come find one with us. Alfalfa Farm Winery is situated on one of the oldest historic farms in New England and has been owned and operated by the Adelman family since 1974. Surrounded by lush green fields, rolling hills and stunning vineyards, the winery is an excellent illustration of the vital and growing field of educational agritourism in rural Topsfield, Massachusetts. We produce a variety of hand-crafted wines and also host customized wine tastings for small groups and more, up to 99 guests in the light and airy White Pine Tasting Room, rustic Silo Room and spacious Outdoor Patio. There’s plenty of space to linger and enjoy the wines on a sunny spring, summer, or fall day. 4 varieties of grapes are grown using our prized estate wines, and we import others locally and from around the world. The blueberries in our highly sought after blueberry wine are Merrimack Valley grown, the cranberries, from the Cape. We harvest our own and receive and process all the fruit on site, from de-stemming and crushing straight through to bottling and labeling, with the help of our fleet of dedicated volunteers. Our “handcrafted wines” are all of that! Whether you are planning a corporate function, ladies’ night out, family reunion, or wish to celebrate any special occasion, Alfalfa Farm Winery has a perfect package for you. The farm is an ideal setting for any private or corporate gathering and offers tours of the winery, vineyard and production processes if desired, along with your special event. All tastings are hosted in The Vinter Room, Rustic Silo Room or on The Patio (weather permitting) and include an etched glass Alfalfa Farm Winery taster souvenir for each guest. If you are interested in a first-hand look at making wine, get your hands (and feet!) dirty by joining one of our harvest or production volunteer crews! Volunteers are an important part of Alfalfa Farm Winery. Please visit the Volunteers link on our website or contact the winery for information. Joining in is both fun and educational! We are open for the season from Memorial Day Weekend to Labor Day , Sundays 1- 5 p.m. and from then until Christmas, Saturdays and Sundays, 1 – 5 pm. $6.00 provides a souvenir etched glass taster, a flight of 5 of our wines on hand, including our signature Sangria, or magnificent mulled wine in the cooler months. More importantly, we provide a place to be, a place to gather or be alone, ramble or ruminate. Four hours available of a weekend afternoon during which we invite you to visit and take away…..you. “We may not need third place association to build a town hall any more, but we sorely need it to construct the infrastructures of human relationships. Ever since the solidifying effect of World War II passed into history, Americans have been growing farther apart from one another. Lifestyles are increasingly privatized and competitive, residential areas are increasingly devoid of gathering places. To the extent of our affluence, we avoid public parks, public playgrounds, public schools and public transportation.” —Ray Oldenburg, “Celebrating the Third Place”. 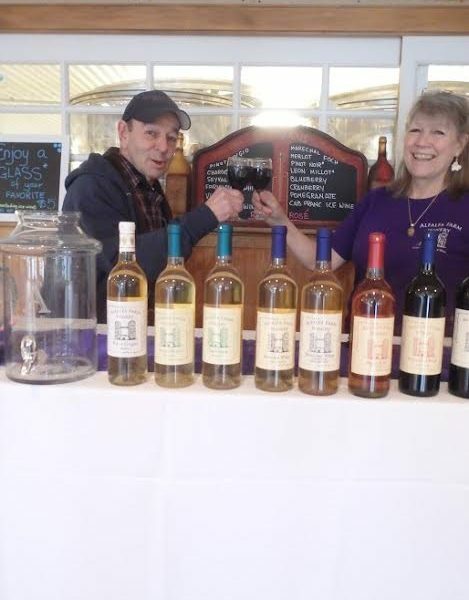 Alfalfa Farm Winery is conveniently located near I-95 and Route 1 in Topsfield. Aside from the vagaries of the weather influencing our crop of grapes, we faced many regulatory issues, starting out to serve / sell wine in a “dry” town. The people of Topsfield were, and are very vocal in support of us, however, and we have been happy to provide a “Great Good Place” for them to relax and re-wine-d. So, as you know, we’re impressed with alfalfa farm winery – tell our readers more, for example what you’re most proud of as a company and what sets you apart from others. We are a volunteer-run farm winery. Our labor is provided by friends, old and new who are able to pitch in on a weekend morning or day. Our volunteers help from bud break to bottle, assisting with just about every aspect of wine production along the way. Our farm winery is set on grounds kept in agricultural use for over 300 years. The original 600 + acres of fine dairy farming pasture and stock is now proudly preserved as a winery with tours and information to enable folks to remember and cherish the past, while looking to the future. Boston is a remarkably accessible city. Close to the North and South shores with beaches bays, mountains and rivers, it has made the most of the land it has reclaimed from the sea. We love that , with modern transportation, Bostonians can be transported “back in time” to rural Topsfield after a mere 20 minute car ride, and find respite and a tasteful way to wine-d down.